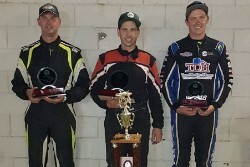 David Smith has won an entertaining Feature Race at the Premier Speedway on Saturday night, which was the round six Grand Final of the Tri-Tech Lubricants Victorian Modified Sedan Series, which doubled as the Di Watson Memorial. The 2012 National Champion, won a race shortened thirty lap A Main, which saw the chequered flag brought out on lap twenty one, after a spate of incidents, the last involving five drivers leading to the Steward calling an end to the race. Smith and Andrew Blackwell would start on the front row for the main event, while Nick Cockerill and Russell Felsovary would start on row two. Cockerill and Brock Atkins would get good starts behind Smith to move to second and third, with Blackwell dropping to fourth, but he would be elevated to third when Cockerill retired after ten laps. Soon after Blackwell and Walters would move to second and third respectively at the expense of Brock Atkins, with pundits on the hill watching a great race with nothing separating the top four drivers. With the race looking set for a thrilling final ten laps, a multi-car crash saw the steward lose his patience after several other stoppages earlier in proceedings, bringing the race to an end, nine laps short of the natural conclusion. Smith would be declared the winner from Blackwell and Walters, who until this round, were the only two drivers to win an A Main in the Series. Only 1.629 seconds separated the top four at the conclusion of the last racing lap.